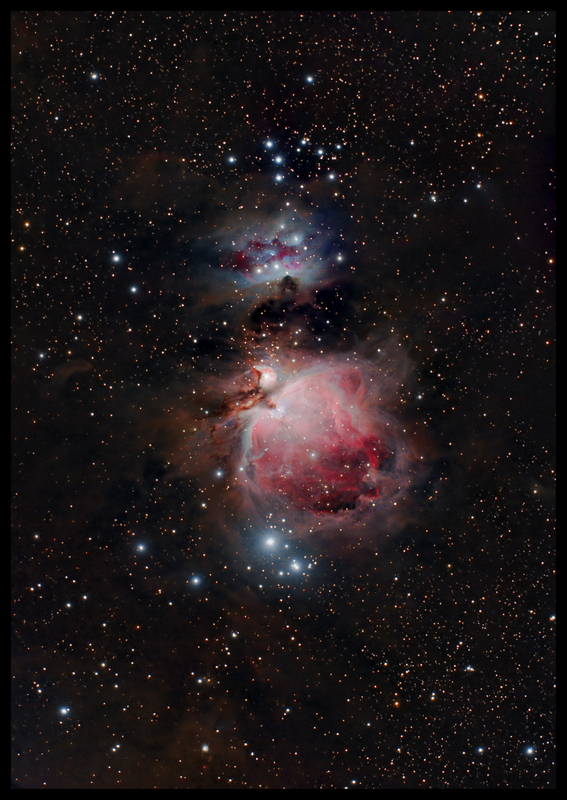 M42 (NGC1976), The 'Orion Nebula', and NGC1977, The 'Running Man' Nebula. The Orion Nebula is one of the most spectacular objects in the night sky. It can be seen as an area of fuzziness below the belt of Orion by the naked eye, and is easily visible in binoculars. A small telescope will reveal the shape of the nebula, and a larger telescope will show a wealth of detail. It is a star forming region and what we know as the nebula is an area of a large molecular cloud that is being illuminated by the hot new stars at it's centre. It lies at a distance of 1400 light years from us and 24 light years across, meaning that we are seeing it as it was just after the end of the Roman period in Britain. This image is nowhere near as deep as some of the other magnificent images of this object posted by others with dark skies, but I was actually quite surprised how much of the surrounding dark dust was captured, despite some quite severe light pollution from Portland Port. All credit to Pixinsight's DBE tool....it made short work of the light pollution gradient while leaving the dust intact. There are a few issues with the image that need fixing.....I hadn'tt got my focal reducer spacing correct and this is evidenced in the corners where the coma is present and also the RGB doesn't exactly line up. I've sorted the worst of this out with the clone tool set to darken, but life's too short to deal with every single star!! Also, there is quite a lot of colour noise showing in the faint dusty regions....this simply needs more imaging time to get a better S/N ratio. All in all though, I think it came out okay and is a reasonable start. 10 x 30 second subs for the core. Captured, calibrated and stacked with Maxim, DBE in Pixinsight (gradient removal) and all other processing in Photoshop CS3.